This is your comprehensive guide to online Star Trek Shopping. We search all those other sites and bring all the music, books, videos, and software they carry to one convenient place! And there's no risk! You're still buying from safe, established, reliable online merchants like Amazon.com, Big Star Video, eToys, Soundstone.com, Beyond.com, and WickedCoolStuff.com. ...WITHOUT having to search and search through thousands of other books, CD's, and advertisements! So browse our easy-to-surf pages, check out our recommendations, gift combination ideas, and we'll be sure to point out special bargains on our Red Alert Specials! page -- deals we've found and highlighted for you. Whether you're an occasional viewer or have cats named "Spock" and "Data"... there's something here for every Trek fan. Take your site to another dimension! Why shop online? -- Let us tell you. This is NOT the official Paramount Store you've seen advertised on TV. The Original Series, The Next Generation, Deep Space Nine, Voyager, The Animated Series, and the movies... they're all here for you on Video. To watch over and over and over again! Fly starships into battle, role-play as a Klingon, or lead the crew of the Enterprise on dangerous missions all from your own PC. 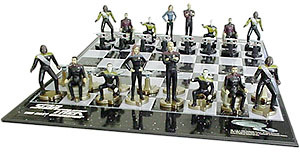 Calendars, toys and more -- all Star Trek! Soundtracks, sound effects, keep the dramatic, inspiring themes playing while you drive, work or relax! Clothes, mugs... any and everything else. We're starting to build a guide to any Trek-related posters... here's what we have found so far.